Upgrade Offer – Complimentary Half Board upgrade available on applicable stays. Please contact us for further details. 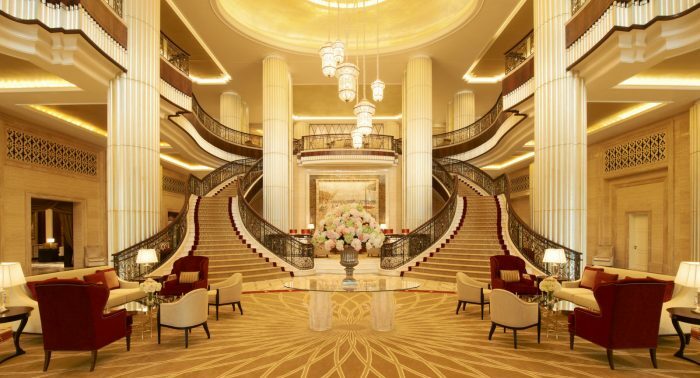 St Regis Corniche, Abu Dhabi is a marvellous hotel offering a Great Gatsby experience. The decadent chandeliers, beautiful art so elegantly hung and the grand stair case is a jewel in the crown. A grandeur cigar room furnishes the ground floor, with wooden, leather and deep red interiors; worthy of a cigar room and guests lose themselves in this perfect hotel, with a grand piano providing the evening’s entertainment. A private beach with golden sands only adds to the fascinating property and with a choice of two pools and the ocean for a dip, guests are able to indulge. The fitness centre is a great way to pass the day and the Remède Spa is a fortress for guests to be spoilt in, with an amazing array of treatments. The aromas of the beautiful restaurants are mouth watering and enticing and the grand lounge area whether on the balcony or ground floor are rich in sophistication. Early Booking Offer – Book early and save up to 15% off the room rate. Upgrade Offer – Complimentary Half Board upgrade available on applicable stays. The 3,200 square metre Remède Spa is a luxurious sanctuary of relaxation and tranquility. The Spa consists of 11 treatment rooms, a wet area and a relaxation lounge, providing ample opportunity for guests to indulge. The St. Regis Butler Service is available if required and is designed to ensure that guest preferences are known and understood. St Regis Corniche, Abu Dhabi is the perfect start to any honeymoon. With its marvellous decor and dazzling beauty there are plenty of extraordinary features to the property. The Nation Riviera Beach Club is on the private beachfront, with a beautiful pool and only the sand between honeymooners and the emerald greens and intoxicating turquoise blues of the ocean. The endless beauty of the beach and the views from the Beach Club are gorgeous and make for an idyllic picture moment. The room are glamorous and extravagant and the furnishings exquisite. The views of the city from the hotel are beautiful and seeing the Abu Dhabi sky lit up at night is a truly magical experience. With such beautiful scenery, St Regis Corniche excelled in the gastronomic department too. Villa Toscana is magnificent in decor, transporting you to a summer garden in Italy. Finely chosen wines compliment the mouth watering dishes and makes for a perfect pass time. The chef and staff at Villa Toscana professionally cook with passion and panache can be tasted.